Do you know who has the Guinness World Record for most clothing collected for recycling? Yes, I do, because they just set the record a couple weeks ago. It's National Geographic Kids magazine. They got kids everywhere to collect more than 33,000 denim things for donation. That's a lot of jeans. Yes, it is! And it's all been on display in Union Station in Washington, DC. Now the organization Cotton From Blue to Green is going to recycle it all into insulation for homes and donate it to communities in need. 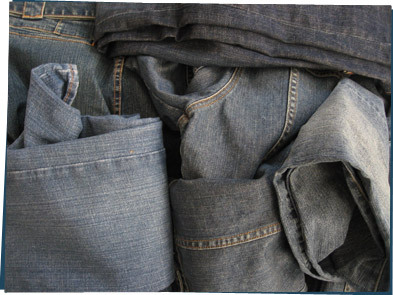 So next time you outgrow a pair of jeans, think about what they could become!